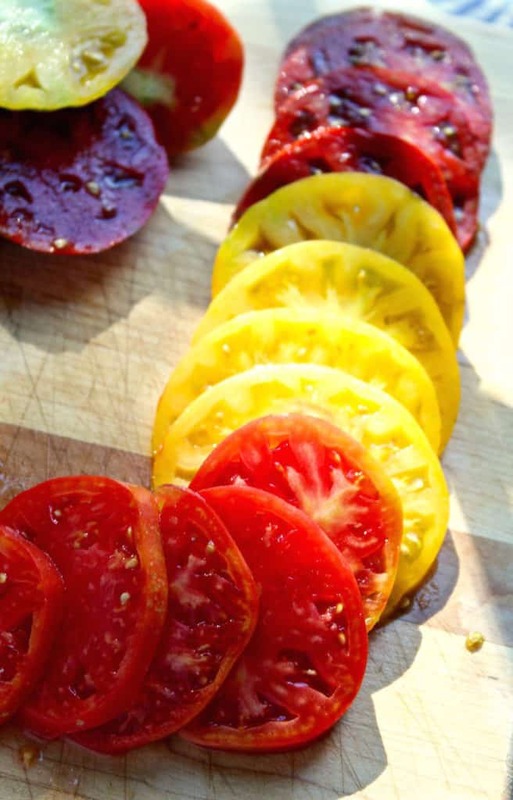 I just came off a weekend marathon of tomatoes, gorgeous heirlooms that I picked at a farm down the road. I made a Caprese salad Saturday night for dinner. While a traditional Caprese has a drizzle of olive oil, I opted for a basil vinaigrette. 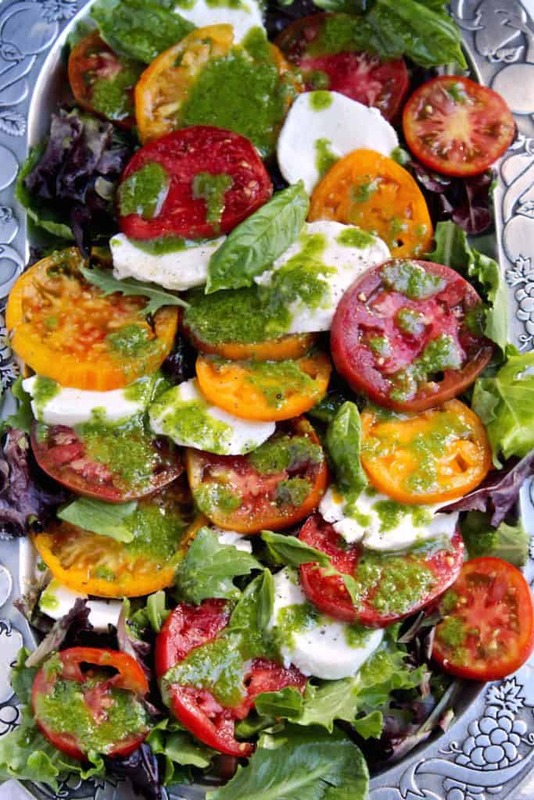 This Insalata Caprese with Basil Vinaigrette is the perfect summertime dish. The bounty at the farm stands just doesn’t get any better than in August. And the colors, I can’t even. So we’re talking tomatoes and fresh mozzarella, sliced and arranged beautifully on salad greens and then drizzled with the basil vinaigrette. A sprinkling of sea salt, a few torn basil leaves and you have the most divine salad on earth. Really, so incredibly fresh tasting, you just can’t get these flavors any other time of year. I don’t know much about heirlooms. At the farm, they have pictures with names at the end of the rows available to pick. A couple times, they let me just choose a few from the boxes they picked for local restaurants. I chose an assortment of red and yellow ones of various sizes and shapes, and a chocolate colored one. I happen to think heirlooms are gorgeous, warts and all. Mine had streaks, cracks and some odd shapes but they were beautiful sliced, like a neon rainbow. 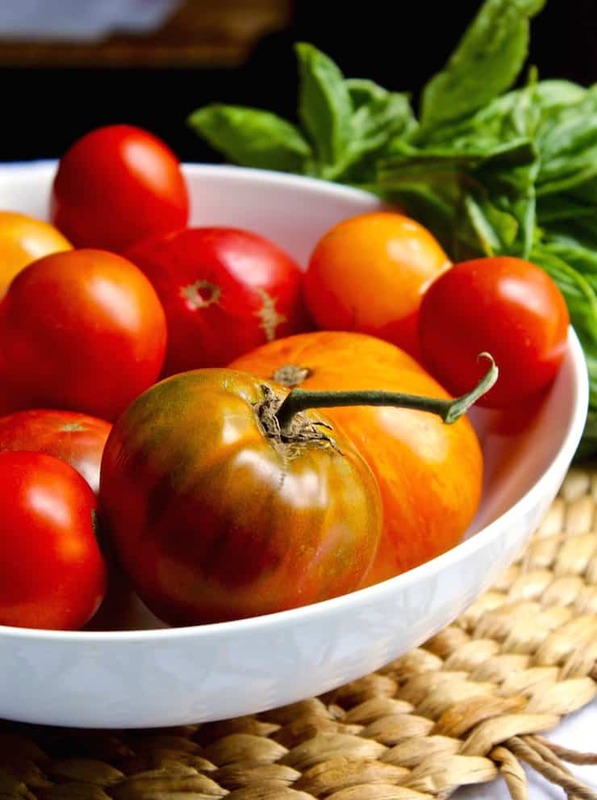 And they were bursting with juicy, sweet, real tomato flavor. Just lovely. You might also like this Summer Corn Chowder recipe, a great soup for all the sweet summer corn that’s now in season. 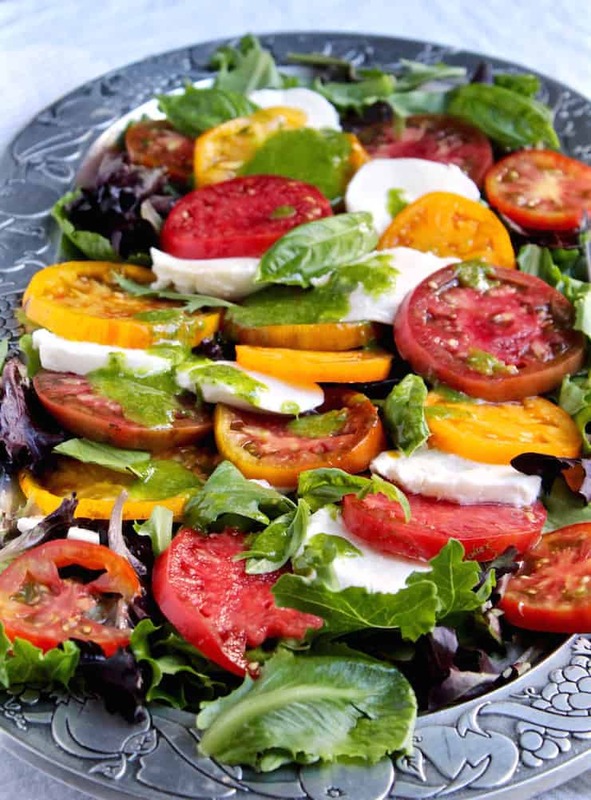 Summer salad of fresh mozzarella and heirloom tomatoes, over mixed greens with a fresh basil vinaigrette. Scatter a serving platter with mixed baby lettuces. 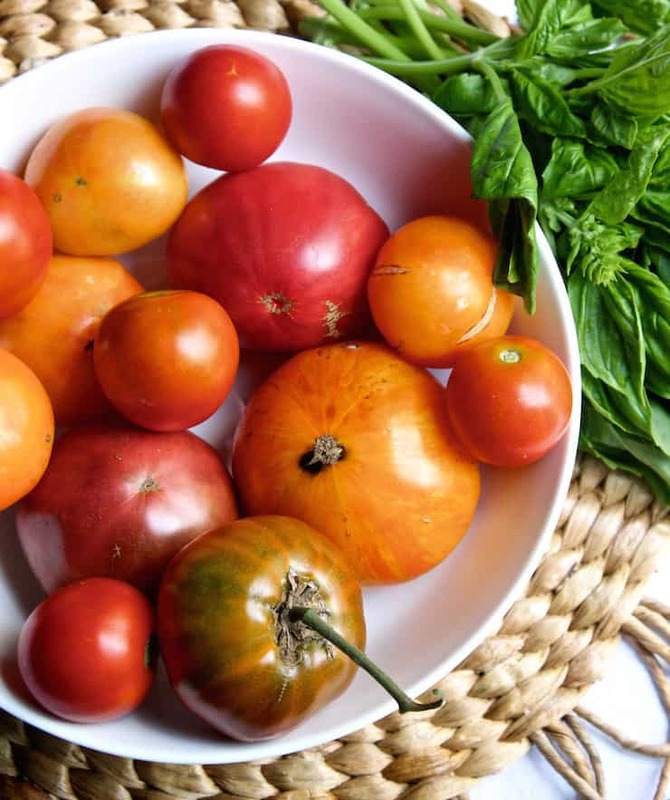 Arrange overlapping layers of tomatoes and mozzarella on top of the lettuces. Sprinkle with salt and fresh cracked pepper. Put olive oil, vinegar, water, chopped garlic, mustard and salt into a blender. 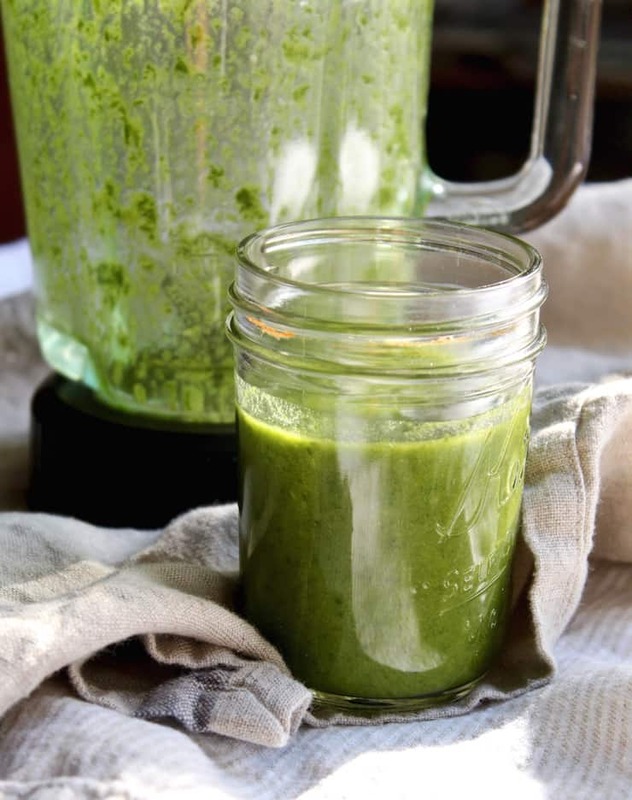 Coarsely chop the basil leaves and add to the blender. Mix on high for about 30 seconds until smooth. If necessary, add a little more water or olive oil to thin. Transfer to a jar. 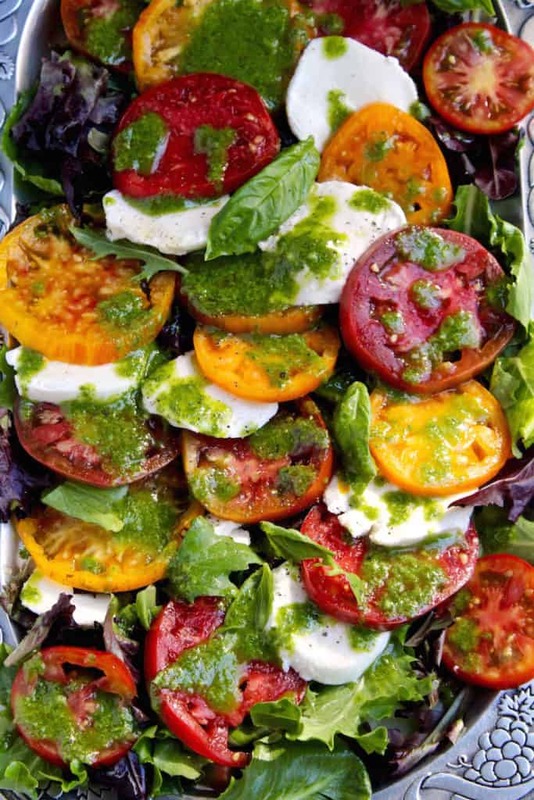 With a spoon, drizzle basil vinaigrette all over tomato and cheese salad. Garnish with a few torn basil leaves and serve. Leftover vinaigrette will keep covered in the fridge for several days, bring to room temp for serving. Do not store fresh basil in the refrigerator, it will turn brown. Snip stem ends and place in a glass of water. Set on counter, loosely covered with a plastic bag.